Some of the things I love about summer are weekend trips to the Berkshires, taking time off for a vacation, and all that means more time available to read books. 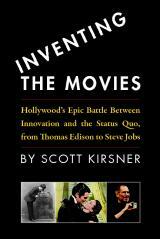 On my summer reading stack this year was an advance copy of Inventing the Movies, a new book by Scott Kirsner that takes you on fascinating romp through the movie industry’s hundred-year love/hate relationship with technology and innovators. The book is an entertaining read with fascinating historical research and fresh insights from interviews with a long list of contemporary luminaries including director Peter Jackson, computer graphics pioneer Ed Catmull, and entrepreneur Mark Cuban. With a keen attention to multiple perspectives, Kirsner presents the view of industry executives who are reluctant to innovate, and contrasts their views with the innovators who have advanced the many technologies like projection, color, sound, non-linear editing, digital projection, internet distribution, etc. that have transformed the industry over a century of change and revived it over and over again for many generations of audiences. Inventing the Movies is a lively book of interest to innovators in any field, as well as people who love movies and want to take a look at the business and technological machinations behind the many screens in their life: cinema, television, home theater, personal computers, portable media devices, and video-enabled phones. Last week I did an interview with Scott Kirsner about the book, how the project got started, and what he plans to do next. The interview is currently being edited will be posted on this blog sometime before September rolls around. The book is now available from Amazon.com. The book is also available as an e-book from LuLu. Scott Kirsners blog post on the book is here.